A Bertin C 270, Perhaps? I don’t think many people would be able to name an Andre Bertin model; his bikes were not exported in droves like many French brands like Peugeot and Motobecane. Americans do love their Peugeot PX10s and their Motobecane Le Champions, indeed, there is a real reverence for the best French models that reached their shores through the 1970’s. Bertin bikes, however, are somewhat of an unknown quantity to those who live outside France. I myself don’t know much about the Bertin brand, though I’ve learnt a lot recently by visiting the excellent website dedicated to everything Bertin. I’m not sure if this really is C270, but it’s the best guess I can make right now without some expert help. There’s a similar bike on the Bertin weblog that has the same decals and must be very similar all round, but there is no model number below its picture. I can safely date it to the mid 1980’s by its decals, its braze-on mountings, the shape of the fork crowns and finally, by its components. It has Columbus Aelle tubing, and a nice build of mostly Japanese mid-range parts. Being 59cm from centre to top, it’s quite a large frame, and with its long stem I find myself on the limit of what I can comfortably ride. 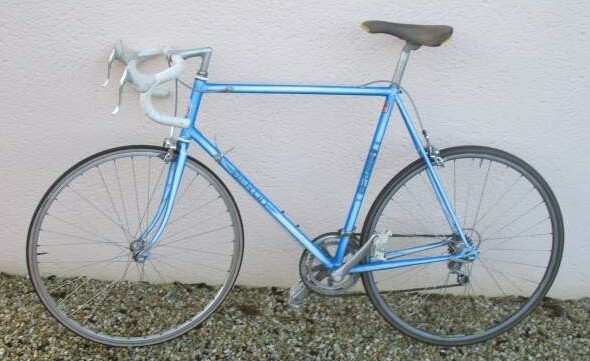 I recently reviewed a slightly older Bertin a few weeks ago which, like this example, was built with Shimano parts. This is not some coincidence. Bertin had actually become an important distributor for Shimano as far back as 1970, which was way before Dura Ace was even a twinkling in its eye. Because of this affiliation, it is not uncommon to find Bertin bikes built with Shimano parts, just like this one. I get the impression Andre Bertin was an astute businessman, and he had no qualms in building his bikes with Japanese and not French parts. Though it was dirty and hadn’t been ridden for a while, this bike was a pleasure to work on. I think in general that 1980’s bike are easier to restore than their ancestors of the 60’s and 70’s, and for good reason; technology had made some leaps and bounds and threadings and sizing were standardised by the time this bike was sold to its new owner in Pas-De-Calais in 1988. The forks were straight, the brake hoods had survived, though one had lost a portion of its rubber, and the clincher tyres miraculously came back to life. Shimano 105 components of this era are bulletproof, and it was no surprise to me that the index shifting was as functional as it was three decades ago. It’s hard to say how much of this bike was original; it’s front hub was a 105 and it’s rear a 600, its long stem was an Italian model by 3t, but they matched the handlebars. 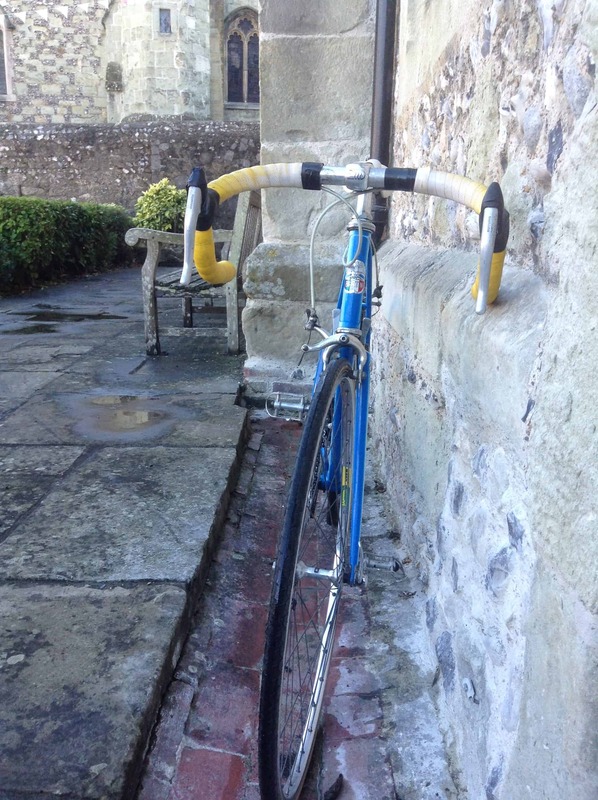 Whether or not some small changes had been made to this great riding bike, it was a pleasure to get this lovely Bertin back on the road, all ship-shape and Bristol fashion. I’m impressed by the Shimano components, and here I think is when this company began to pull ahead of others in the bike industry. 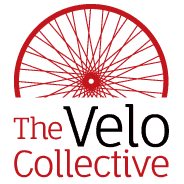 Bertin bikes benefited by it because of their intimate relationship with the big Japanese firm. What we have, therefore, is a great mix: a cool Columbus ( Italian ) built frame by Andre Bertin ( French ), dressed with excellent parts ( Japanese ) for a cool looking bike with excellent performance. Who said that life in the1980’s was all bad..? It’s probably a Bertin C 210 or 220. They were 3 main tubes Aelle with painted forks and frames. The C 270 and 290 had chromed forks with painted frames which were all Aelle, I believe. The 210 and 220 only differed in which gruppo they had hung on the frame. Yours looks to be upgraded Golden Arrow so I am guessing a C 210. Thanks Jim, I was hoping you’d bring your expertise to my poor attempt of identifying this bike! Cheers.